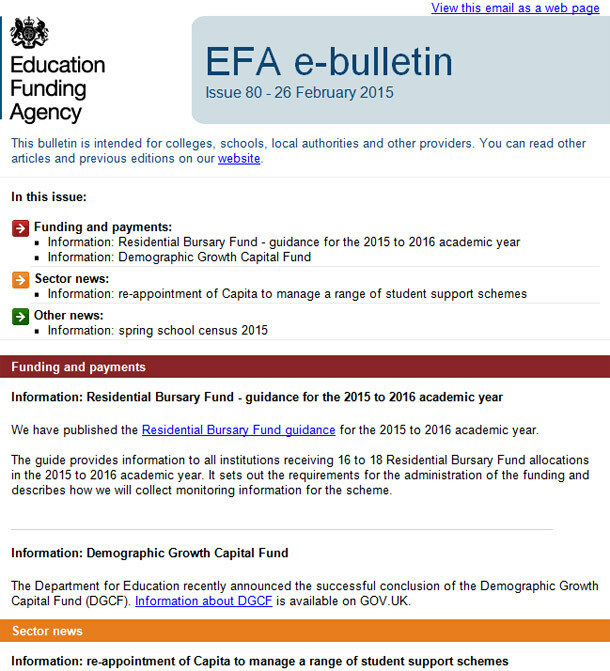 Christine Cuddihy, Corporate Communications Officer at Education Funding Agency (EFA) explains how the EFA has been using weekly e-bulletins to engage and prompt a growing audience of around 25,000 subscribers. A combination of GOV.UK and email analytics tells an interesting story. About a year ago, EFA went live on GOV.UK. Since then, we’ve been analysing how our GOV.UK content performs alongside our other communication channels. EFA has a very specific, but broadly dispersed, customer base. Our challenge is to support these customers so they can perform the tasks required of them at different times of the year. The e-bulletin is just one tool we use to do this. It acts as a signpost with short summaries and links to draw our customers’ attention to information and guidance, when they need it. Google Analytics shows that the e-bulletin has a huge impact on the number of views our GOV.UK content gets. On the day of the 26 February issue, the e-bulletin was the source of 22% of sessions on EFA pages, making it second only to Google search. When we look at individual pages, the story is more compelling. In the same issue we included a link to our ‘16 to 18 Residential Bursary Fund’ page. The e-bulletin was the source of 97% of traffic to that page between 23 February and 1 March. So why not rely on social media or blogs? Analytics show that our customers aren’t using social media that much. One of our tweets and Facebook posts linking to a GOV.UK page in January generated a total of 62 sessions, out of 1,298 unique pageviews on that page. We’ve also been told that they don’t want lots of individual emails and would like a single message from us with everything they need to know. We know that this might change as more of the UK becomes digital by default. So it’s important that we keep talking to our users and monitoring the performance of different channels. We can get data from our mailing system to understand how different types of users interact with our web content. We want email to complement our web content – and to do this effectively we need to know how both are performing. With this data we can understand more about the user journey, giving us valuable insight about what information different organisation types find the most useful and when. We can also use this information to analyse the effectiveness of our content on GOV.UK. By comparing e-bulletin engagement with enquiries we receive, we can check how useful customers find guidance on GOV.UK. For example, if we know a customer has looked at our web content but it still doesn’t answer their question, this gives us evidence about why we need to improve our web content, and how we might do that. Something we initially found challenging was getting data from Google Analytics and our mailing system to match up. Data from our mailing system said that the e-bulletin generated a high volume of traffic to GOV.UK pages, but Google Analytics acquisition data told the opposite story. After some conversations with GDS we discovered that this was to do with the tracking code we used in our mailing system, which Google Analytics didn’t recognise. Once you have the string, you can enter it into your mailing system as a tracking code which the system will then add to any URLs in your newsletter, meaning Google Analytics will recognise the source of the traffic generated. Since we’ve been using a tracking code, our data matches up so we can be confident in what we’re analysing. This means we can continue to improve, monitor and compare the performance of our channels – and, more importantly, how these meet the needs of our customers. Excellent. It shows that it pays to not make assumptions (as we all often do) that social media is now all-pervasive and should always be the top of our list of channels. A little bit of insight can prove otherwise. Well done. I'm wondering which email system you use to design and manage your mailshots? Hi Caroline - apologies for the delayed response. We use Maxemail to send our e-bulletins. Great article. I agree a well thought out e-bulletin can have a huge impact on web traffic. With much emphasis being placed in social media, an engaging e-bulletin can often be a massively overlooked asset.